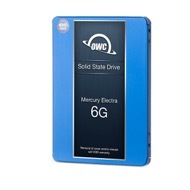 The OWC 6G SSD and OWC Accelsior S DIY bundle is the simple solution to add a high speed SATA 6G drive to PCs or silver Mac Pro towers otherwise restricted to 3G architecture. Combined with the high-performance Mercury Electra SSD, Accelsior S brings cutting edge 6G performance to your SATA 3G system. Faster startup and quick response times with over 500MB/s peak sustained data rates, the Mercury Electra 6G SSD line delivers unbeatable performance with 100X greater data protection than enterprise class Hard Disk Drives, and RAISE technology for RAID like data protection and reliability. And it's backed by a 3 Year OWC SSD Limited Warranty. With more than 500 MB/s of throughput, the Accelsior S dual-lane PCIe 2.0 card delivers flexible storage expansion – with a speed boost – to your Mac or PC. Accelsior S is the perfect complement to OWC's Mercury family of high-performance SSD's, allowing up to an extra 1TB of fast storage expansion. With no drivers or extra software needed, upgrading your Mac Pro or PC tower with a Mercury Extreme Pro and Accelsior S is a breeze. PCIe 2.0 x4 slot or better is required. Use of a PCIe 1.0 x4 slot will reduce performance. 2008 Mac Pro. These models have two x16 PCIe 2.0 slots, which enable Acceslsior S to deliver full throughput. Installing Accelsior S into of the two x4 PCIe 1.0 slots will result in Accelsior S being addressed as a gen one, one-lane card with performance limited to real world 190-200MB/s data rates. 2006-2007 Mac Pro. 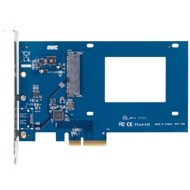 These models utilize PCIe 1.0 slot which cannot be configured (even with the Expansion Utility in OS X) to address Accelsior S as anything but as a first generation one-lane card. As a result, Accelsior S performance will be limited to 190-200MB/s data rates. If maximum data rate speedis desired, we recommend the installation of a 2.5" OWC Mercury SSD in an open Mac Pro drive bay. 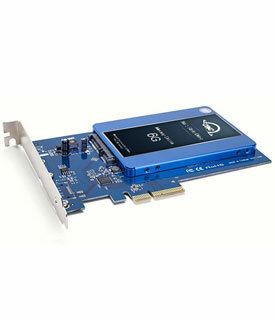 Compatible with PCIe expandable servers with the specifications listed above. Rating: 5/5 Speedy! January 14, 2019 The install of this card/SSD is as straightforward and as simple as can be. Formatting is a breeze, and the card sped my Mac Pro up significantly. I had an SSD in it prior to this, but with the Accelsior, it seems a bit faster than the SATA connected SSD. Rating: 5/5 my mid-2010 Mac Pro is flying now... November 5, 2018 I was a little nervous about this (both the install and the technology, which I was too lazy to read about). I've had really good luck with OWC, though, so I gave it a shot. **big** improvement over the same SSD in one of the normal drive slots. Only weird thing is that the system sees it as an extrnal drive. Rating: 5/5 Extended the life of My 2008 Macpro 3,1 October 16, 2018 Mac Sales, OWC Accelsior S with and a 2.0 GB SSD made my 2008 MacPro 3,1 not only usable, but a joy to use again. The Accelsior S really, really sped up my old mac, I am now running Mojave 10.14 (through a 3rd party patch) and the computer feels as good as new. I highly recommend Mac Sales and commend them and OWC for coming up with such innovative products that extend the life of MAC Desktop and Laptop computers. Seriously, my 10 year old MAC Pro is running better then new ! Rating: 5/5 Worked great on Dell PE R710 September 30, 2018 I was looking for a solution to get maximum out of dell PowerEdge R710 server. Onboard SATA ports only support ATA/IDE mode and SSD drive was getting 200 MBPS read write speeds. With this card AHCI is enabled and I got 530 MBPS read write and 56000 IOPS for read and write. I am using 1 TB samsung 850 ssd drive as boot drive on this card. One thing I did was I removed dell perc 6 card from the riser and updated bios to latest version 6.6.0 I would definitely recommend this to anyone looking to utilize old r710 servers for ssd drives. No drivers needed. Rating: 5/5 Flawless September 27, 2018 Works as advertised; no issues installing macOS, no issues booting. Rating: 5/5 So good, I bought 2 September 13, 2018 These PCIe host adapters work really well in my mid-2012 Mac Pro. Heck, I bought two of them for the two SSDs I have. Rating: 5/5 Great product! September 11, 2018 I put this card in my mid 2010 Mac Pro. I used a 6g 500gb ssd with it and created a boot disk. My Mac booted perfectly and recognized the drive. I now enjoy the full read/write specs of the drive. This improved my computers performance beyond my expectations. Great product! Rating: 5/5 Works great, drive bootable without driver July 6, 2018 The attached drive boots fast and doesn’t require any special drivers. Installs easily in a Mac Pro 2009-2010. I’ve had it for quite a while now and have had no issues. Rating: 5/5 Bringing back to speed Mac Pro Early 2008 (3,1) June 29, 2018 With the new Mac Pro only available in 2019, I decided to take the plunge and upgrade once more my 10-year old faithful Mac Pro, by adding 32GB of memory (and keeping 8GB of the previous 16GB to total 40GB) and installing a PCIe SSD drive. This allowed to install the OS (OSX El Capitan is the last update possible on this machine) and apps on the SSD and keep all user files on the original Macintosh HDD. After one failed attempt to do the configuration myself, I redid the process successfully exactly as explained in OWC's Youtube video (https://www.youtube.com/watch?v=Ou-heXnkPP4) except I did not clean/delete any system files or apps from the HDD so to keep it as a backup bootable for safety. The total boot time is now 2 minutes instead of 20. I also created a FCPX "scratch library" on the SSD that speeds up performance tremendously as FCPX constantly refreshes projects in the library during editing; then when finished I move the project (in FCPX) to the original HDD library. All other apps of course load and execute much faster. Perfect way to keep an old Mac Pro going. Rating: 5/5 Fast! May 20, 2018 I used to have a SSD connected in the lower optical bay. The speed on this set is way better. Rating: 5/5 Great speed boost! April 28, 2018 I’ve been booting my 2008 Mac Pro from a 500 GB 6Gb/s OWC SSD since November with no problems whatsoever. Installed it in 5 minutes, then cloned my old boot drive to it using Carbon Copy Cloner & has been running flawlessly since. Rating: 5/5 Took a 2010 Mac Pro from old to FAST April 18, 2018 This unit along with a 6G SSD made a big difference in my 2010 Mac Pro. Easily doubled the read/write speed of the 6G SSD compared to the sata installation. Well worth the price and very easy to install. Rating: 5/5 Excellent product providing additional disk March 29, 2018 I have bought this host adapter plus a 1TB OWC 6G SSD in order to provide an additional disk for my 2010-vintage Mac Pro. The disk mounts as an external disk ergo is suitable for loading macOS (as opposed to any version of Windows, which must be loaded from an internal disk). You just plug the adapter in, and it works without any hassles. Rating: 5/5 Excellent! March 17, 2018 Great card to speed up a SSD in an aluminium MacPro AND keep your 4 usual SATA slots for classic HDDs! It's only slightly more expensive than a 2,5" adaptor but it's so much more useful! Highly recommended if you want to get the best out of any SSD in your MacPro. Rating: 5/5 Easy to install and storage upgrade. February 19, 2018 This product provided additional storage space and increased the speed of my computer. Rating: 5/5 Fantastic way to renew an old Mac February 18, 2018 My MacPro 2010 had become sluggish to the point that from boot until first moment of usability was around 20 minutes! I installed this SSD and put a fresh OS on it. Now my Mac is like a brand new computer, and I’m no longer afraid to reboot. Rating: 5/5 This product is a real gem! January 1, 2018 Got this and a 2TB SSD for my Z800 and it just works without complication. I am seeing 520+ MB/Sec read and write speeds. Rating: 5/5 Accelsior S: Adapter frees up main HD Bays December 19, 2017 Bought 2 of these April , 2017 one for me other for gift. Makes better use as a boot drive for Mac Pro(Early 2008) & frees up other 4 HD bays. Rating: 5/5 It was about time! October 17, 2017 Purchased this to "boost" performances on my old MacPro version 3.1. Don't know why I waited so long. Delivery was quick, the SSD disk responds well and migrating my principal drive was a breeze using Carbon Copy Cloner. From start to finish, from installation, formatting and cloning the ex-principal drive onto the SSD drive took a little under one hour! Rating: 5/5 Just Great Availabilty with High Sierra not Raid Compatible. October 8, 2017 Thanks so much for having a 2TB option available to use in place of my Apple Raid. Apple will eventually support Fusion Drives, but no mention of Raid support. This bundle is so easy to install. I transferred all of my files from the Raid using Carbon Copy Cloner, booted up to the new drive and installed macOS High Sierra and even updated to the Supplemental Update and am now good to go. I’ll probably be back for the recommended graphics card soon. Rating: 5/5 As Advertised August 4, 2017 I was already running an SSD as my boot drive on a Mac Pro 5.1, so I didn't gain a huge increase in startup speed, but my apps sure seem to run smoother. Easy install, up and running in 5 minutes or less. A very cost-effective way to update your hardware, AND free up a drive slot. Rating: 5/5 Speed Demon June 6, 2017 I bought this adapter to install an OWC 480GB SSD in my old Mac Pro (Early2008). Super simple installation, fantastic results. Really boosted my Mac's performance. Rating: 5/5 Another Great Product by OWC May 27, 2017 I bought this to put in a MacPro I am setting up as a home file server and now this leaves one more slot open for another large hard drive. It was an incredibly easy install. Installed a fresh OS and away we go. I leave the machine on 24/7 and this runs flawless. Only thing I ran into is that it wont let a machine fully go to sleep if you're using it in a desktop that you like to leave running. Other than that the acces time and reliability has been great! Rating: 5/5 Awesome May 21, 2017 Really breathes new life into my Mac Pro while I wait for the refresh. Next up the Accelsior Pro Q.